I’m definitely a creature of habit. 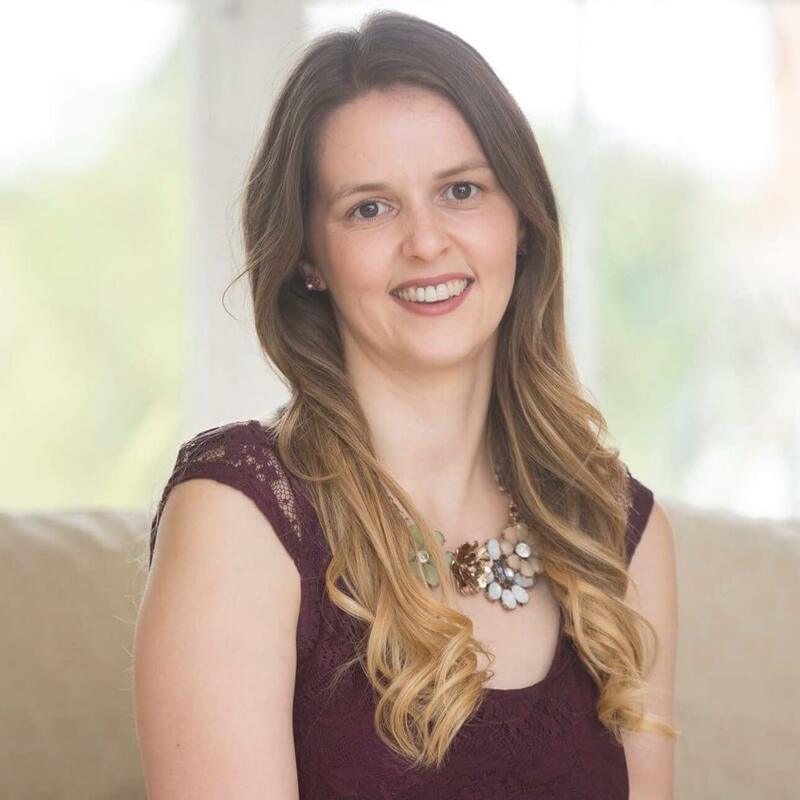 From a young age, I’ve thrived from daily routines and it’s no different now I’ve got children. 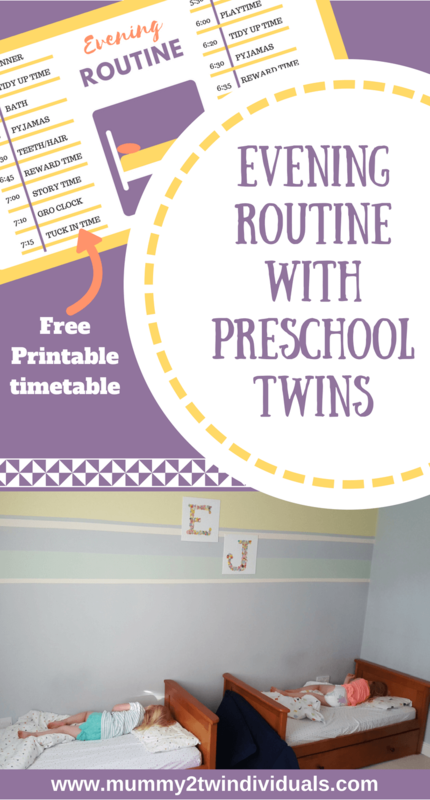 In fact, I think routines are even more important now. I want my girls to know what’s coming. Because it’s the same every night, I think it helps make bedtimes calm and predictable. This wasn’t always the case. Last year when we moved them from cots to beds, it took well over a month to establish the new sleeping arrangement. Every night was a battle. As much as I tried the super nanny strategies, the girls pushed against them. One or both would be up and down like yo-yos until they finally crashed hours later. Finally I handed over to Daddy. I was at breaking point and couldn’t keep doing the same thing and seeing no results. Daddy tried a different tactic. He broke all the rules…talked to them, cuddled them more and it worked. After about six weeks we did it and now they sleep from 7:15pm – 7am. We eat around 5:30 as that is when Daddy gets home from work and we like to eat as a family. The girls have between 30-60 minutes after dinner until the bedtime routine kicks in. Often they will happily just go off and play whilst we tidy up after dinner and catch up on each other’s day. Right or wrong but we don’t bath every night. Normally, it’s every other or every third night at a push. On bath nights, we go straight from dinner to the bedtime countdown. Before we go upstairs, everyone pitches in to help tidy. 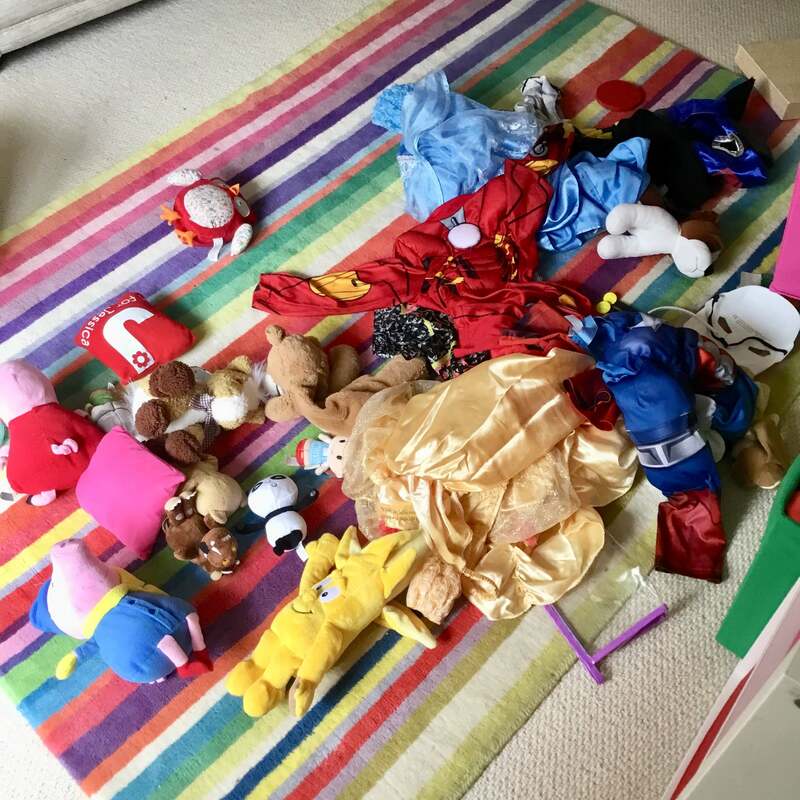 We do a complete sweep of the entire downstairs to get all toys into the playroom. We then speed tidy together to get everything back in its rightful place. We keep bath time short. A quick wash and out. Daddy and I work together to dry and dress one each. Daddy is then in charge of brushing teeth and I dry hair. Emily comes with me first and then they switch. If the girls have had a good day they get to each choose one episode of a programme to watch. 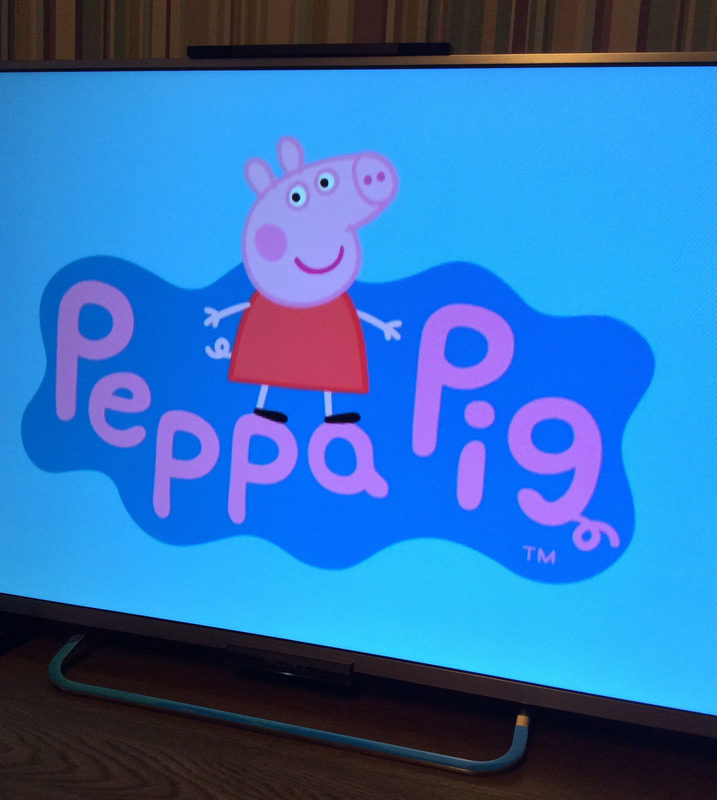 Paw Patrol, Peppa Pig and Hey Duggee are current favourites. For us, we decide this based on whether one or both have needed some time out on the bottom step. If either has lost their TV time, they still get to watch their sister’s choice but it’s just one episode instead of two. There are a lot of studies that discourage screen time before bed. However, as this is often the only screen time they get and because it doesn’t affect their ability to fall asleep, we’re happy to offer it. On non bath night the girls put on their pjs and have their TV time straight after tidy up time. When both are settled in bed, whoever was left downstairs gets called up to say goodnight. 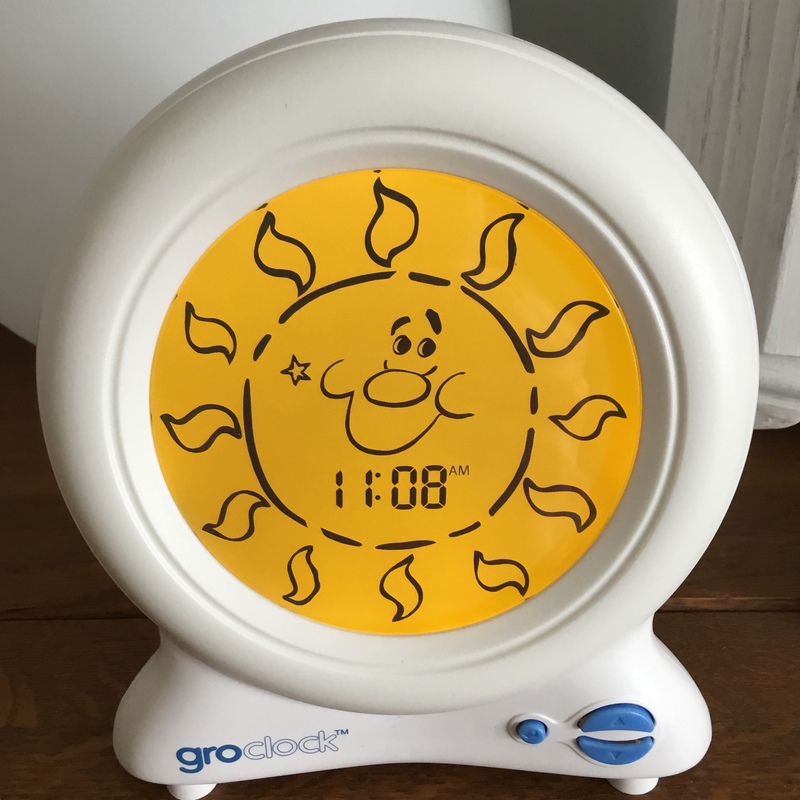 The girls say goodnight to the sunshine on their gro clock and I say a silly little phrase and do actions to copy the sunshine transforming into a star. I then go to Jessica and Daddy goes to Emily. We take a few minutes with each to chat about their day and tell them about the following day. It’s short but it’s one of my favourite times of the day to get precious one on one quality time. Daddy and I then swap and I go to Emily. There are lots of kisses and cuddles and we end our tuck in time with the phrase…kiss, cuddle, hug and squeeze. We then leave the room and shut the door. Nine times out of ten that’s it. They will go to sleep and stay asleep until morning. 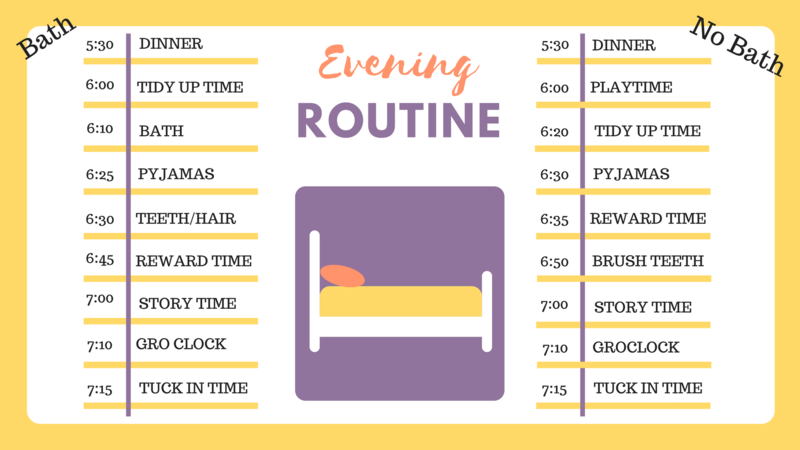 How predictable is your evening routine?